Along with school-minded people in the Georgia senate, we tried to change the state law in 2018 and 2019 but lobbylizards were successful in protecting the free money taken from schools to subsidize the new Plant Vogtle. In 2018 Georgia Senate Bills #355 and #393 would have stopped Georgia Power taking school tax money. In 2019 Senate Bill 112 would have saved schools MILLIONS. The lobbylizards won out so EVERY DAY of EVERY MONTH Georgia Power and some other power companies in Georgia keep taking school money for free. Who says it's a good idea to take school money to build a power plant? How did the surcharge start ? Georgia Power pushed through a law in 2009 that forces customers to pay the surcharge. Residential customer Ms. Stumpf kept track of the extra charges on her bill: Over $700.00 and counting ! As most schools in Georgia, The Savannah-Chatham Public School System has paid surcharge money as part of their monthly bills to Georgia Power. It�s money the schools could have used to hire an additional four teachers. Hundreds of thousands taken directly from YOUR local schools and school districts! taken by the power company to build their private power plant. Money is being taken from schools all over the state every month by Georgia Power. They add a nuclear construction surcharge to the school electric bill. In Atlanta, they are taking about a million dollars a year from APS to build their nuclear plant. This is school money paid in school taxes. Georgia Power takes it to build their plant, so they can sell power from that plant. Atlanta Public Schools could better use that money for school purposes. We need to amend the state law that lets Georgia Power take school money. Shameful. Ask yourself, where did this law come from? The unfair surcharge [Georgia Power] pushed through in 2009 needs amending, so schools aren't forced to put any more scarce school money into this private VogtleVortex money pit. School tax money that's supposed to be for schools is taken for the nuclear surtax. however, who here, or who statewide in Georgia, will argue that it is a good idea to take school money to build a private company's nuclear plant? 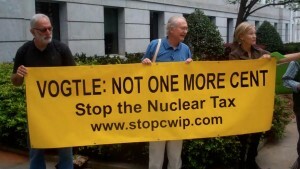 The Georgia Power lawyer said, "They shall take the surcharge money...It�s the law." They should know the law. They wrote the law. Well, it's time to amend that law. This year, the surcharge is taking one million dollars from Atlanta Public Schools. And that�s why the law that forces Georgia Power to take schools' money needs to be amended in 2018 to exempt schools.